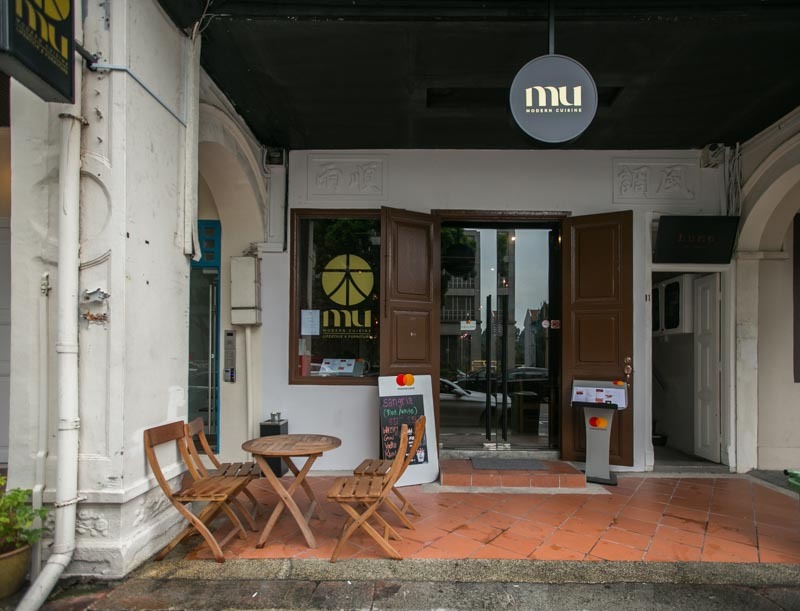 Tucked away on Mohammed Sultan Road, House of MU combines comfort European food with collectable Burmese Teak Furniture. 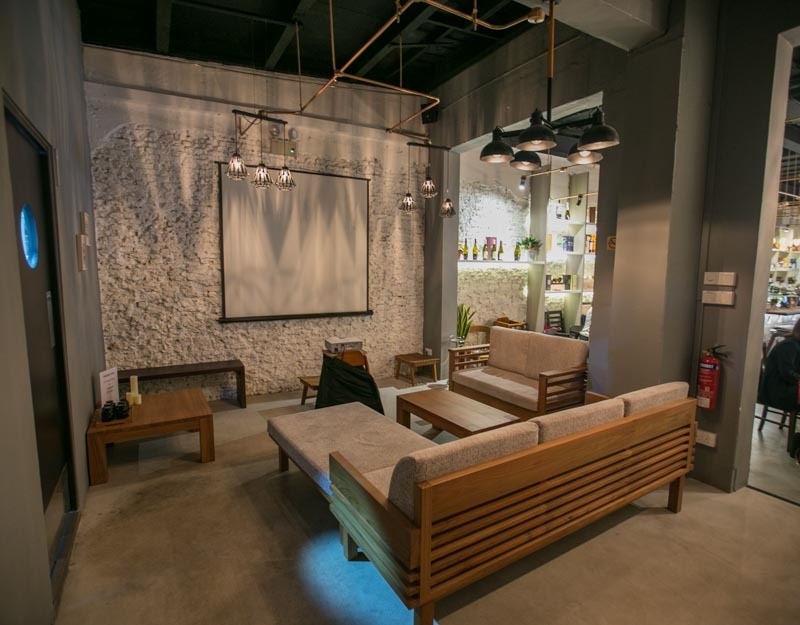 Upon entering the establishment, we fell in love with the laid back atmosphere inside. From the soothing jazz music to the woody-industrial interiors — we immediately felt at home. 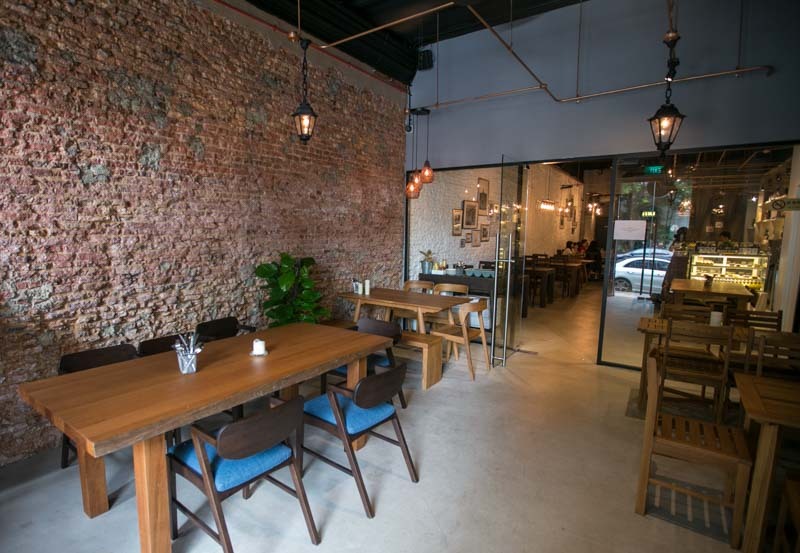 Did I also mention that every piece of furniture in this restaurant is handmade from Burmese teak? If you come across any piece of furniture that interests you, you can even inform the servers. They’ll be more than happy to assist you in acquiring a similar piece that will be custom-made as per order. As we settled down and made ourselves comfortable on the communal table (another one of their beautiful pieces made from Burmese teak), we were handed the menu. 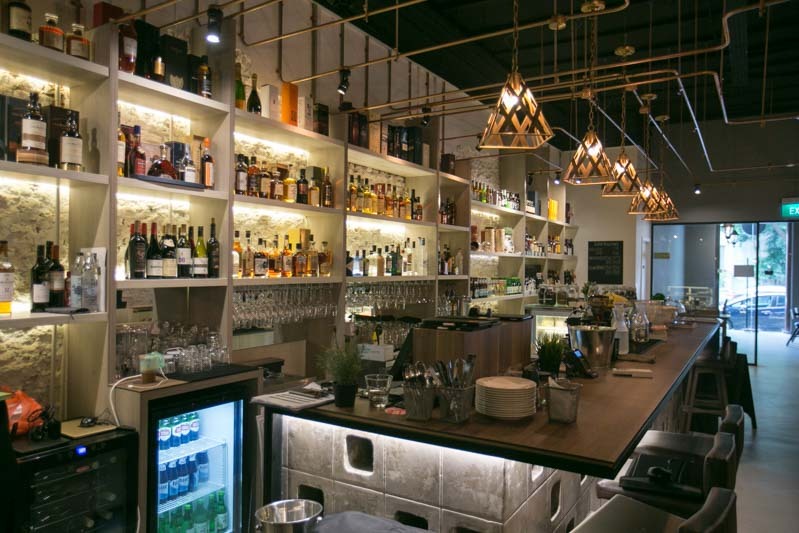 The simple yet sophisticated menu is carefully curated by Chef Tyrell Joon, who has amassed years of experience working in Michelin-starred restaurants such as Les Amis and Iggy’s. We kickstarted our feast with their soup of the day ($9). That price for an unassuming “soup of the day”? 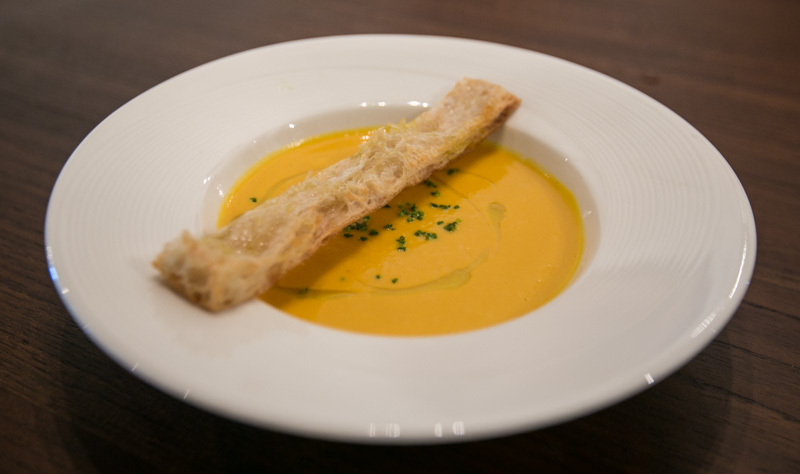 I’d usually give that a miss, but this cream of butternut squash served with freshly-baked Pan de cristal (Spanish crystal bread) was simply irresistible. Like its name suggests, the bread had a delicate and brittle texture to it. 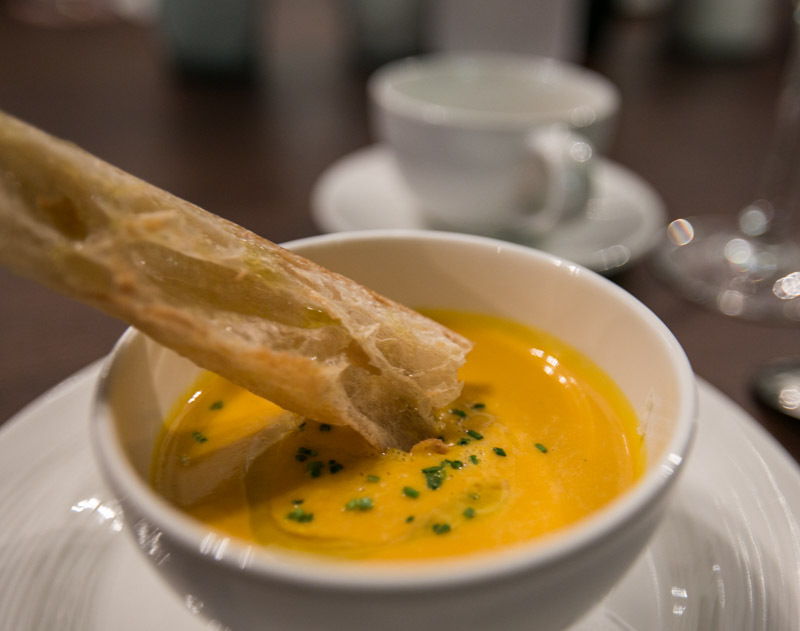 We loved the lightness of the bread by itself, but dunked in the creamy (and slightly cheesy) butternut squash, it was just so satisfying. It was a matter of seconds before everyone emptied their bowls. 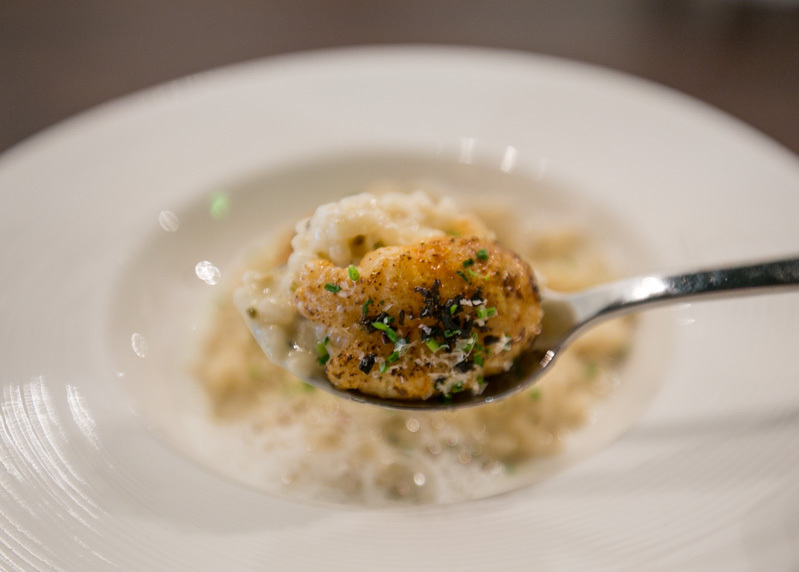 With our bellies warmed up, we moved on to the appetiser, Pan-seared Scallops ($19 for 3 scallops). 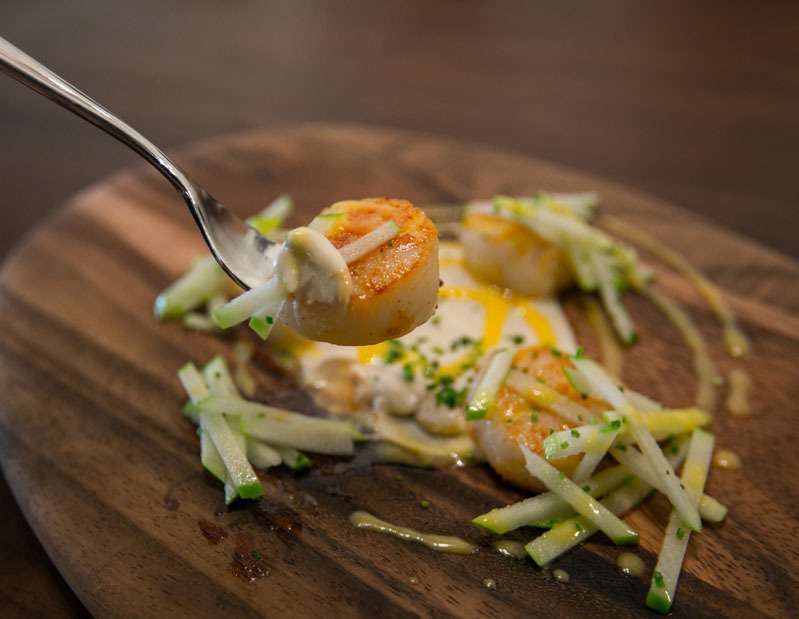 These juicy pan-seared French scallops were placed atop a pool of creamy cauliflower puree and garnished with julienned green apples, which gave the dish a refreshing twist. 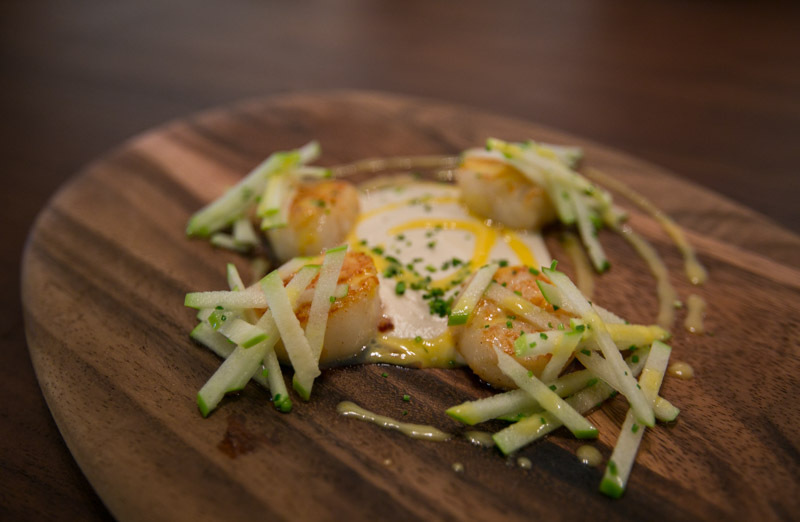 However, I would recommend adding just a couple of strips of the apple, to prevent it from overpowering the taste of the fresh and succulent scallops. I love having the liberty to choose what goes into my food, but this is usually available only at fast food outlets or grab-n-go salad kiosks. Hence, this freedom to create my own pasta or risotto, rather than restricting the options to a few standard options appealed to me. If you’re feeling generous and feel that you deserve a treat, you can even zhng your risotto or pasta by adding in a huge variety of premium ingredients. 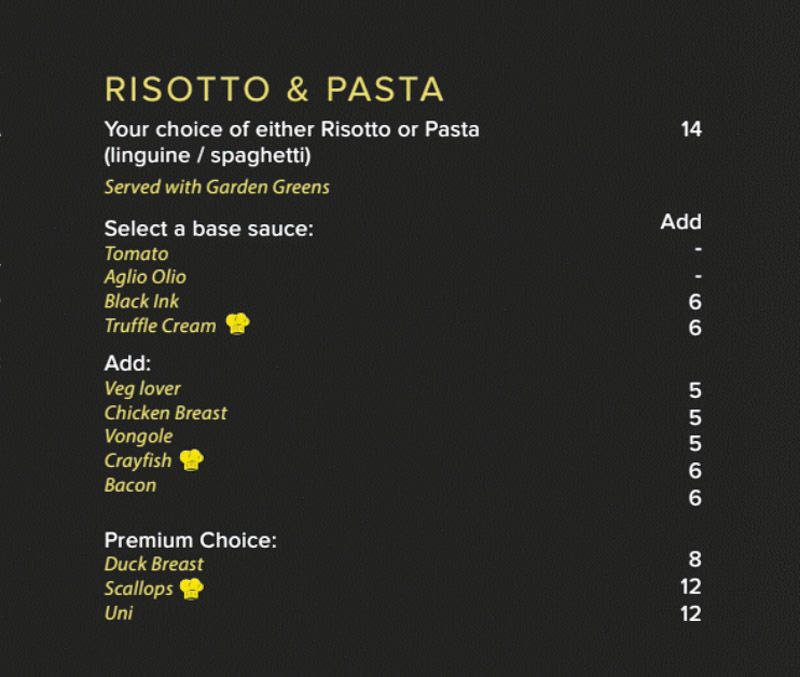 How does a truffle cream linguine with uni, scallops and crayfish sound? I don’t know about you, but just the thought of that made me salivate! 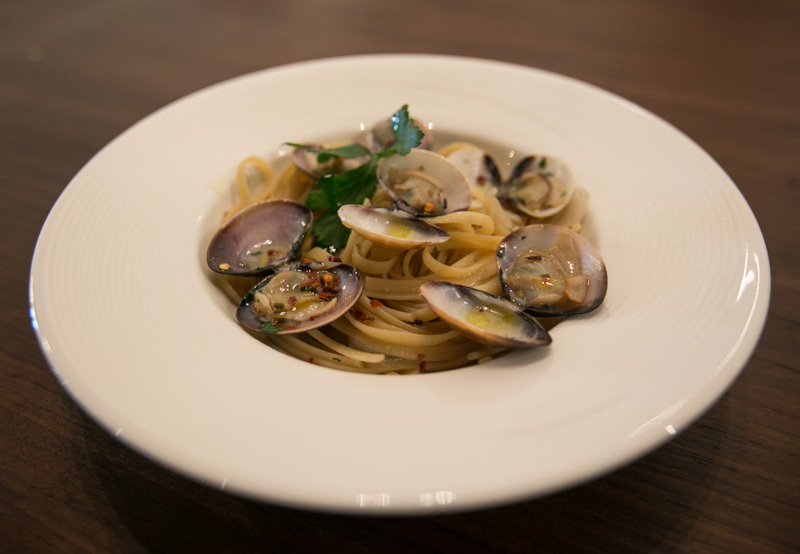 We had the Linguine Vongole in aglio olio base sauce ($25). The al dente pasta had a nice bite to it and was well-coated with the flavourful sauce. 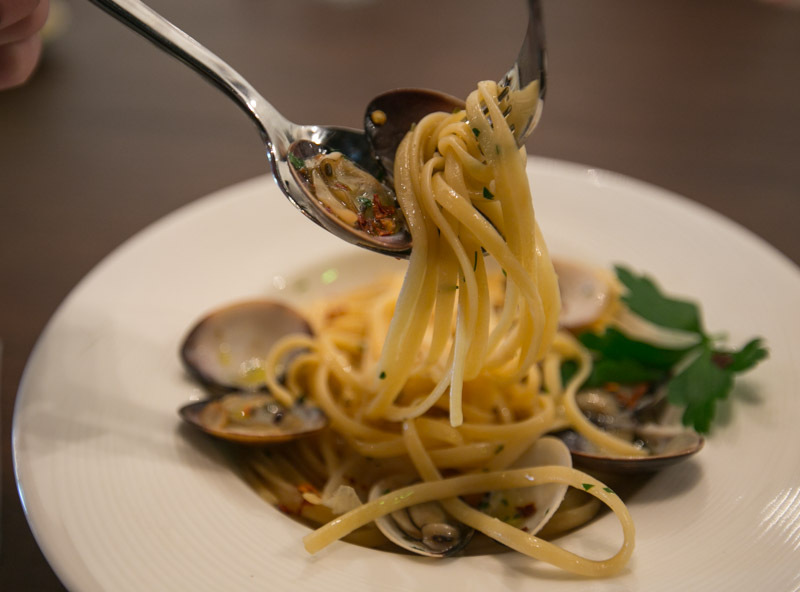 I think it was great how the fragrant garlicky taste of the aglio olio was not too overpowering (so you don’t have to worry about going back to the office with a “garlic breath”). 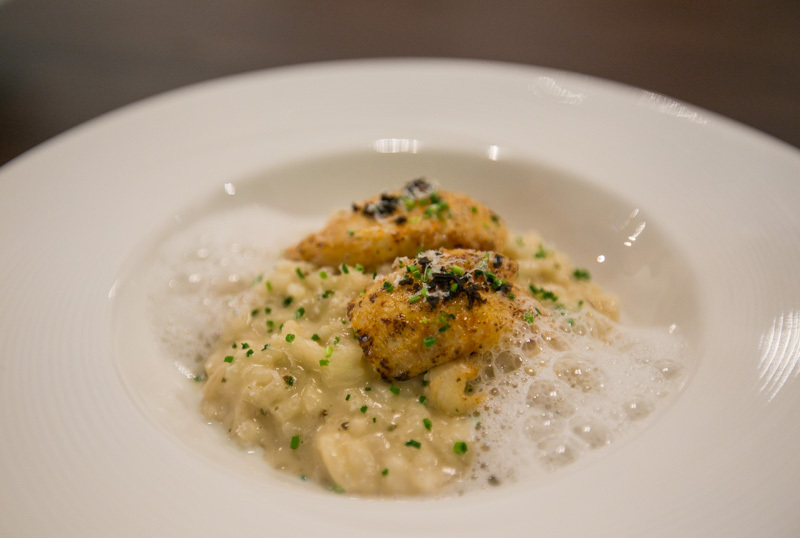 Next up, was the Crayfish risotto with truffle cream sauce ($26). Once again, it was another simple yet splendid combination that we enjoyed thoroughly. Personally, this creamy and luxurious rice dish from Italy is one of my go-to comfort foods. The addition of crayfish and truffle just elevated it and it sure as hell hit the spot. A round of oohs and ahhs went around when the final dish was placed on our table. 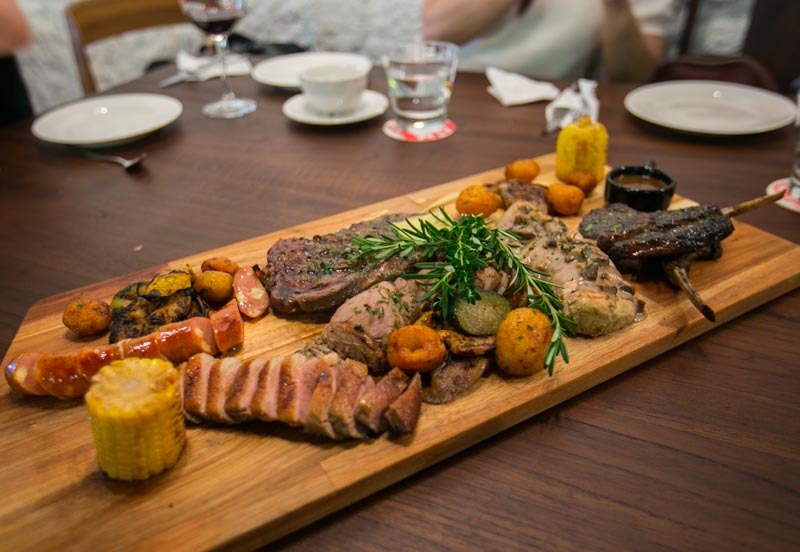 The MUnster Platter ($138) features a massive medley of meat (Josper-grilled prime cuts of black Angus beef steak, US pork tenderloin, lamb rack, duck, sous vide chicken breast, and smoked cheese sausage) and it’s perfect for three to four pax. 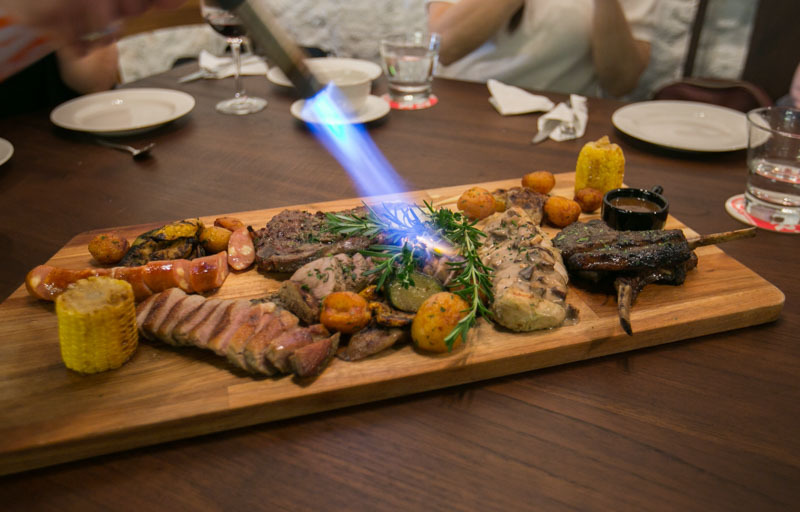 The rosemary sprigs lying atop the meat were torched upon arriving at our table. It released a pleasant aroma and helped enhance the flavour of the meats. 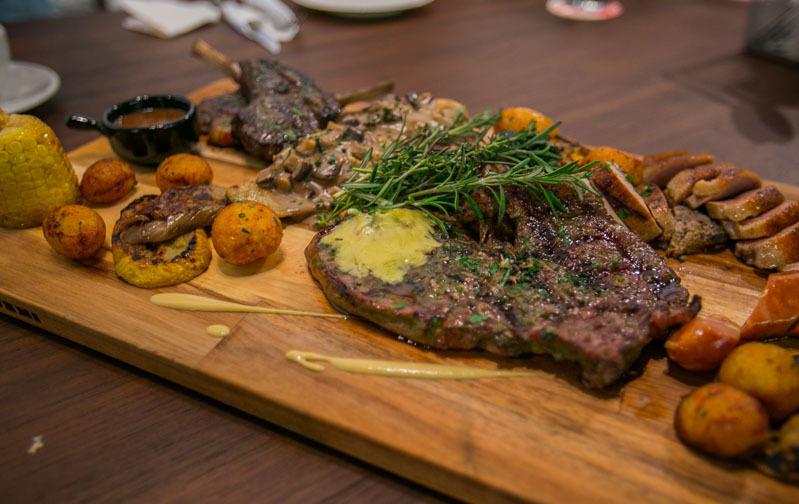 While it may have fared well in terms of its presentation, we felt that this platter did not quite live up to our expectations, given the initial hype upon its arrival at our table. The lamb and steak tasted a little gamier, and we found the duck a tad too dry. However, we would like to give a special mention to the roasted baby potatoes and vegetables. Taste and texture-wise, it was near perfection. That being said, it was a little disappointing that the meat wasn’t the star of the show in this meat platter. Instead, it was the “calefares” (aka the sides), that stole the limelight. 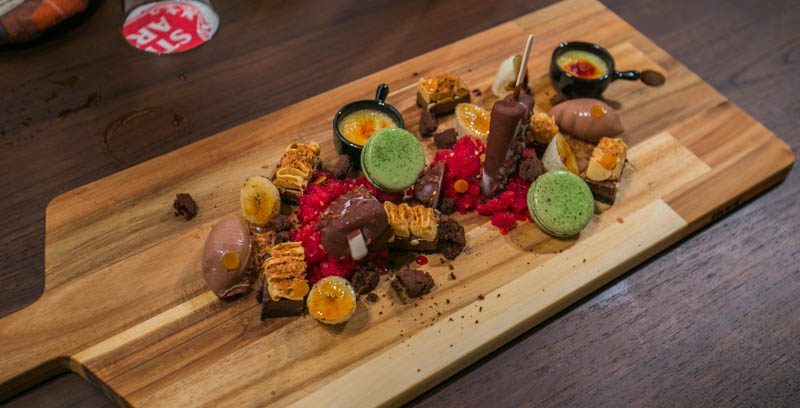 As the dessert platter ($48) descended on the table, it was clear that this was going to be a crowd-pleaser. 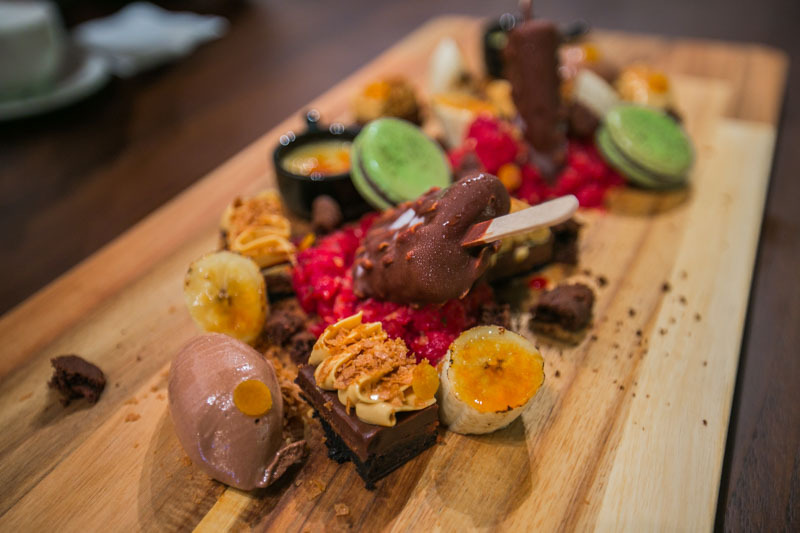 It consisted of an assortment of matcha macarons with chocolate ganache, creme brulee, chocolate ice-cream, chocolate mudpie, caramelised bananas and frozen peanut butter ice-cream popsicles with raspberry granita. The myriad of colours and array of decadent desserts was guaranteed to give any sweet-toothed person a dessert-gasm. However, my only gripe would probably be the portioning of the desserts. While it may seem a little too much to be shared between two, a few of the items only had two portions, such as the macaron, ice cream and creme brulee. Things can get pretty messy if you come with a party of four or more! No elegant lunch affair is complete without a glass of wine. 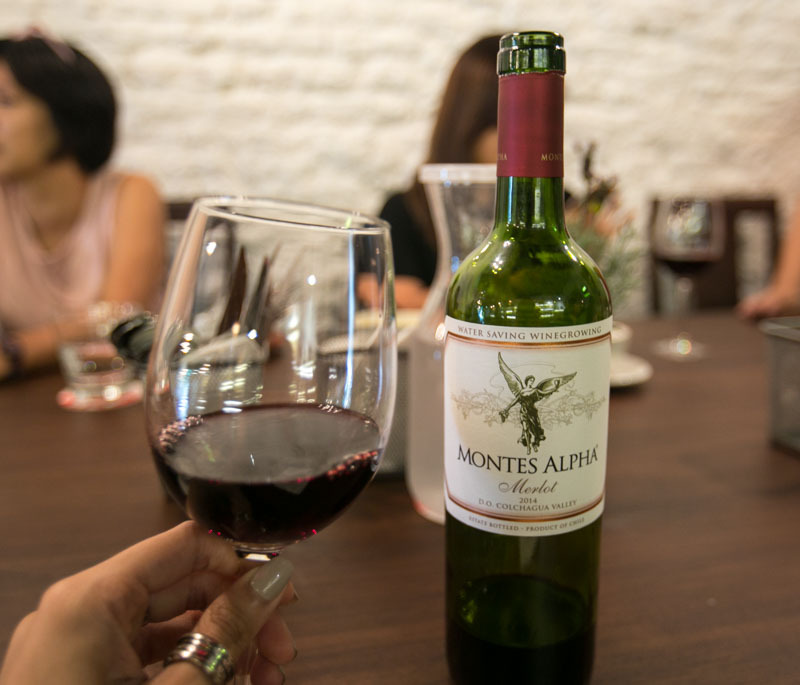 We had a bottle of Montes Alpha Merlot 2014, which was just one out of the extensive selection of alcohols they offer. 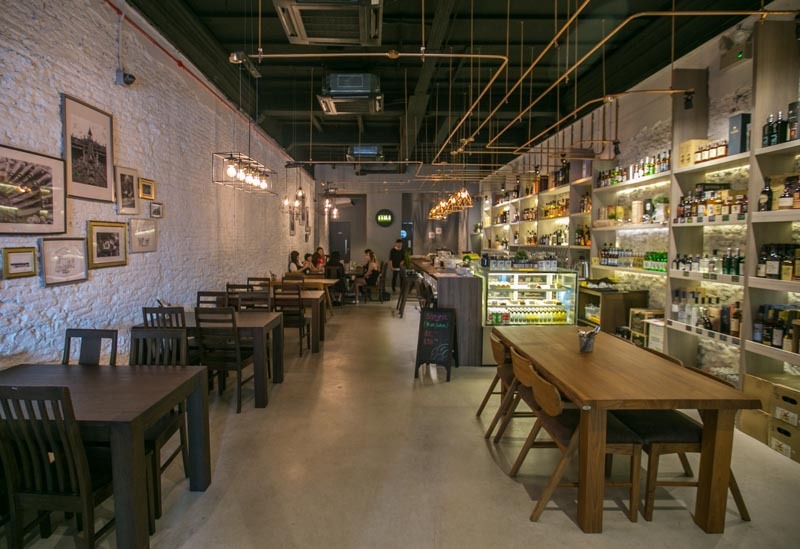 Without a doubt, this is the ideal location if you’re looking for a place to have a hearty meal or simply while away your afternoon with a cup of tea (or your choice of poison — given the large selection of alcohol).